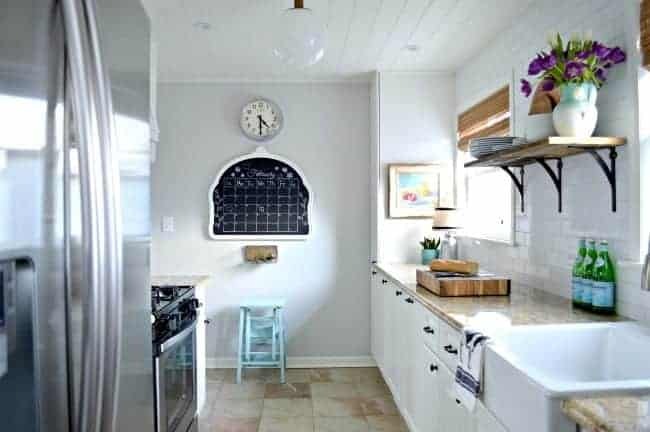 I am so excited to share another project with you from the kitchen renovation. Yes, it’s another job crossed off the list, but it’s one of the things that was on the top of my must have list from the very beginning of the kitchen remodel. 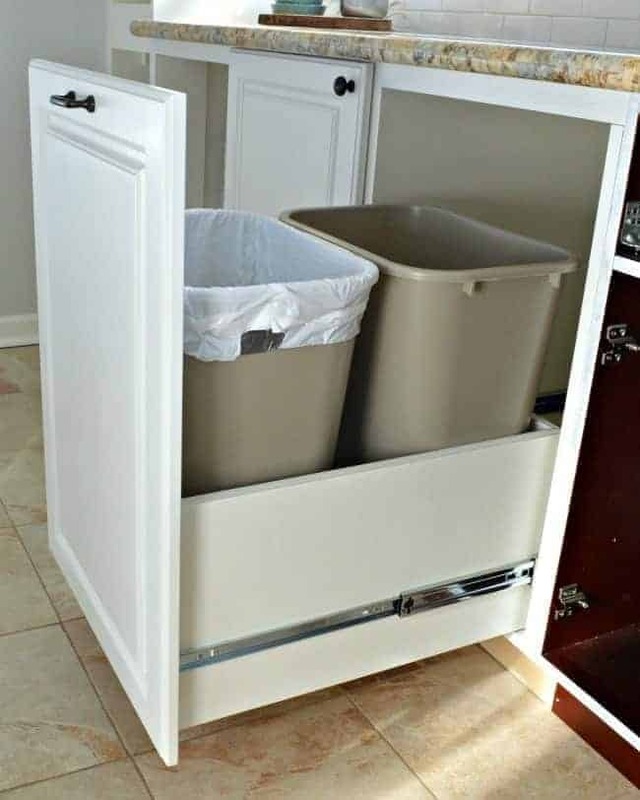 Not only that but it’s a great solution for some of the kitchen storage issues we face…a DIY trash drawer. Right now we have a stainless steel garbage can and a very ugly plastic recycle bin sitting out in the kitchen. They are always in the way and I hate looking at them, so I really wanted to be able to hide them away. I have always had my garbage cans out in the open and easily accessible. It’s never been a problem before but with space at a premium, we didn’t have a good place to put 2 bins. Kitchen storage has been a huge problem in this small space since the day we moved in. 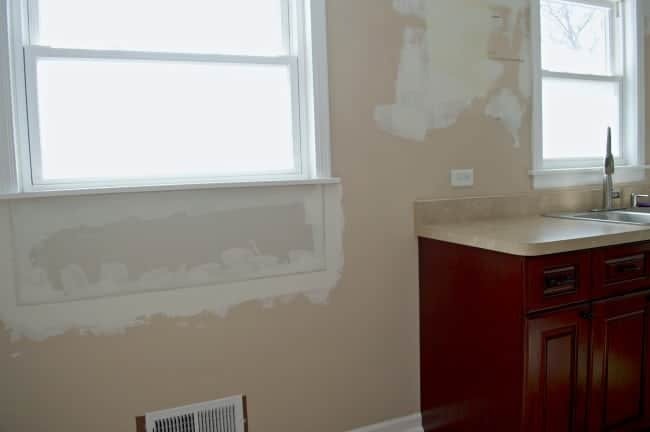 The only way to solve the issue was to would be to construct a custom cabinet on the empty window wall to hide them away. 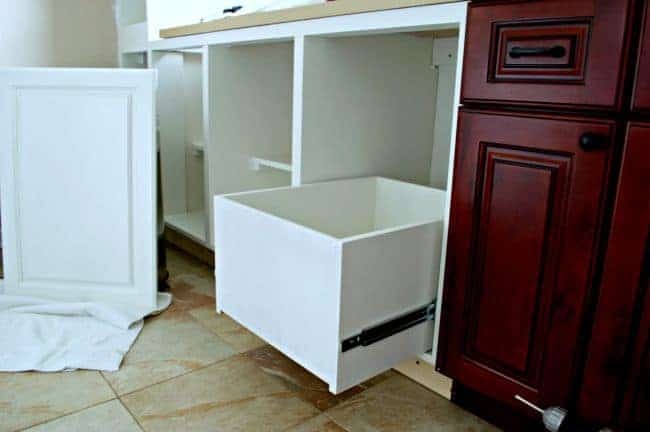 Once the cabinet was constructed and installed, we built a wooden box to house the garbage and recycle bins and attached a soft close drawer slide on either side. There’s even some space in the box to store garbage bags and recycled plastic bags. The door for this cabinet was a lucky find on our very first trip to a local ReStore, at a whopping $2. 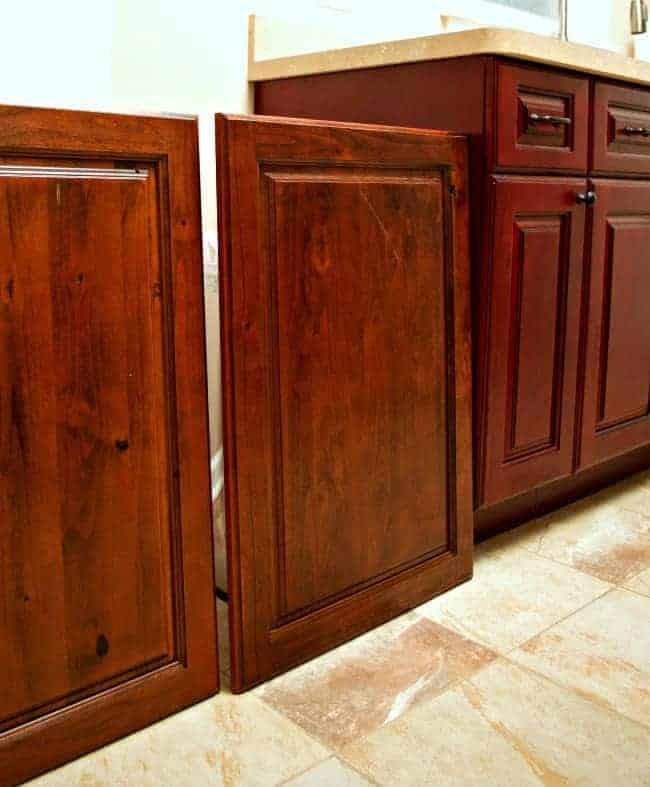 Not only was was the door the exact size we needed, but it was made of solid wood and it was a pretty close match to our existing cabinets. 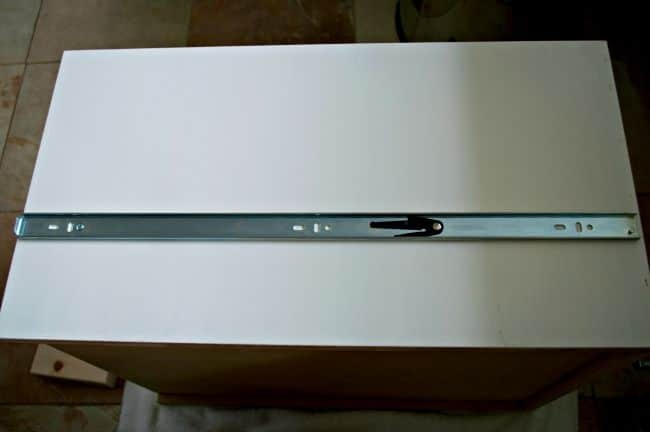 On top of that we found a second door that we were able to use on the cabinet next to this one (also for $2). All I had to do was putty and sand the knots, then they were ready for primer and paint. To attach the door to the drawer, we just screwed it on from the inside of the drawer. Instant garbage/recycle drawer…well…not exactly instant but it’s pretty close! 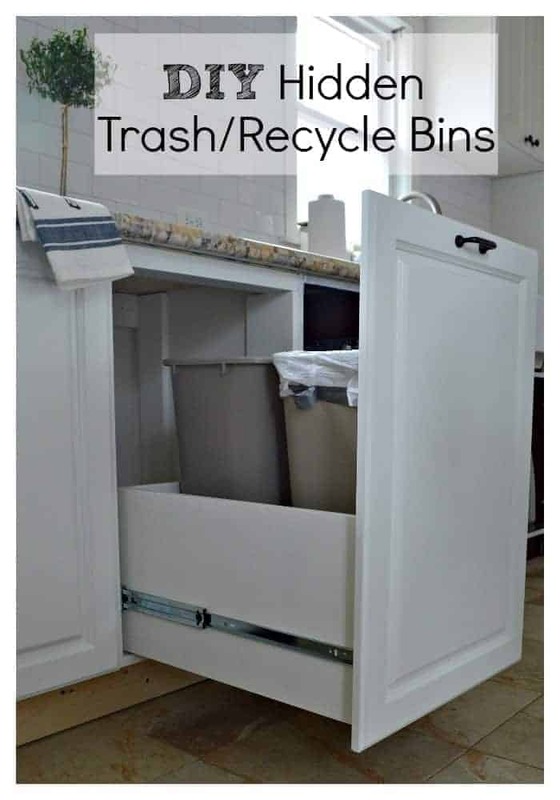 Now I don’t have to look at my trash and recyclables every time I go into the kitchen. Plus, it opens up the space where the cans were and keeps the dog from getting in the trash. A double win. I love how it turned out! 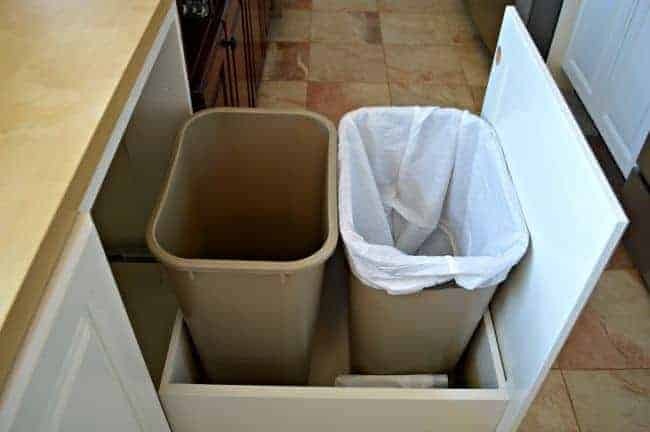 What is your opinion on garbage/recycle bins? 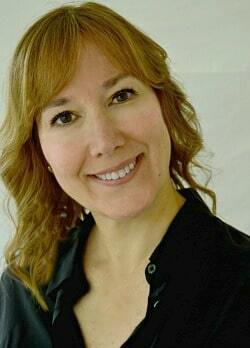 Are you ok with them out in the open or do you need them hidden away? You can see how the whole kitchen remodel turned out, here, and check out a recap of projects and sources, here. What wood did you make the box out of?looks great! Thanks Michelle! We used MDF to construct the box, we had scrap pieces left over from another project. You could also use pine. Hope this helps. 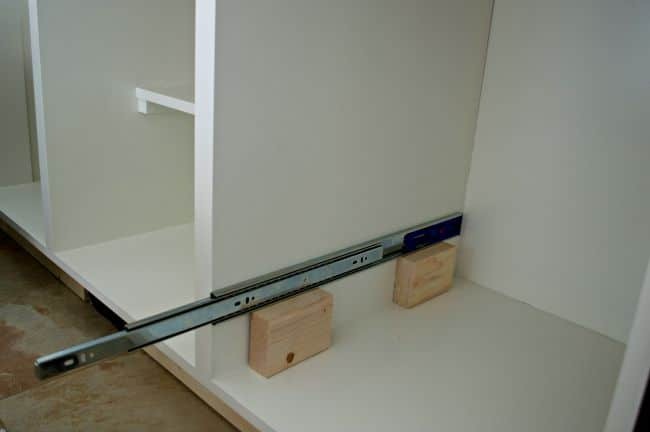 Did you build the cabinet bases from scratch or recycle from the restore as well? How many square feet of granite did you have and how much did it cost? Hi Pam. 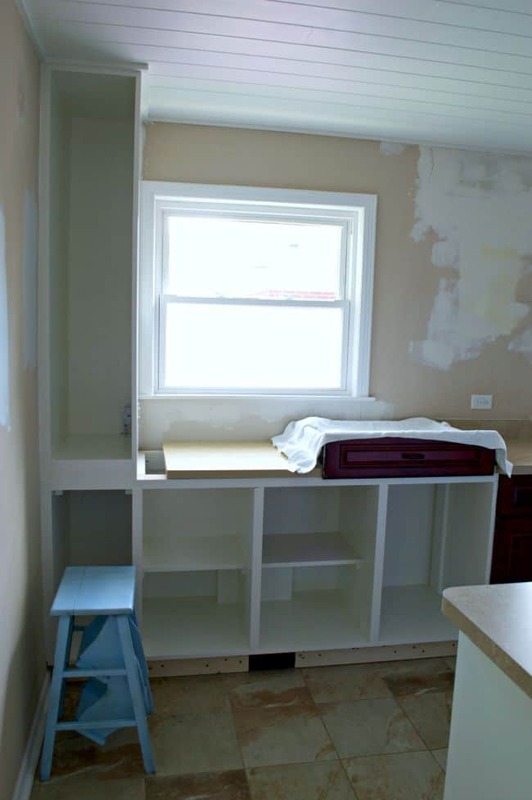 We used the cabinets from that were in the kitchen and we built a set of them on the wall that had none. We bought 2, 12 foot slabs of granite and paid about $800 for both. I wish I had the cabinet space for it, my recycling bins are currently in the laundry room. Love your DIY version! Thanks Vel. I probably would have put them in a pantry, I would like to put my food in a pantry ;), but we have no extra room for one. I don’t know Shirley! I just wish I had done it sooner. 😉 Thanks for taking a peak at our progress. Happy Thursday to you! 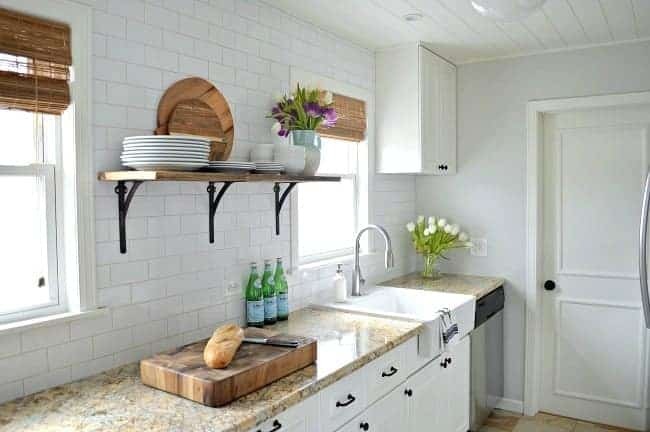 Your kitchen is looking great and I love the bin storage! I have ALWAYS wanted this kind of thing! Trash cans are not attractive. Growing up, my mom always had the garbage under the kitchen sink (she still does, actually), but it doesn’t allow for the normal 13 gallon size. Now, in my own apartment, we just have it off the side of the counter (with the flip-y kind of lid, so it’s not having garbage entirely out in the open at least). I like my trash and recycle bins hidden away. Right now I’m working on what to do with our trash can. In the utility closet? Under the kitchen sink? Hmmm. I’d like to have it completely out of the house. Well, that’s not practical, is it? Your solution is wonderful. I don’t have the space for that, though. Our garbage is hidden away. We didn’t have room for the official trash cabinet, so we just have a pail on a rolling track under the sink…out of sight! Glad you were able to cross another to-do off your list! It’s always good to cross something off the list, big or small. I’ve never had my garbage hidden away but now I’m wondering why we didn’t do it sooner. I absolutely love it. So need this myself and we will have it when we reno our kitchen. A beautiful job.